Busy physicians are burning out because they are working very hard to see many patients and many are getting discouraged. Those who are working in a cash-only practice are probably experiencing less burnout. Those in concierge/boutique practices are also enjoying a healthier work/life balance. 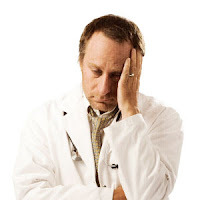 However, for the majority of physicians who are dealing with insurance companies and high volumes of patients, they are experiencing burnout and they're looking for a change. Over the past six months, many physicians have approached me to learn more about non-clinical career opportunities because they want to leave clinical medicine. It's quite unfortunate to see so many physicians disheartened by the practice of medicine. We need good physicians to serve the public. We need capable and willing physicians who will accept Medicare and Medicaid. What's going to happen in the setting of health care reform? We're going to have more patients out there who will demand medical care, but we'll have fewer physicians in the workforce.